Las Vegas’ apartment boom has brought numerous projects to the suburbs, with properties offering loads of amenities and higher-than-usual rents. Now, amid talk that developers have been overbuilding, some are turning to areas that got ignored in recent years: urban neighborhoods. 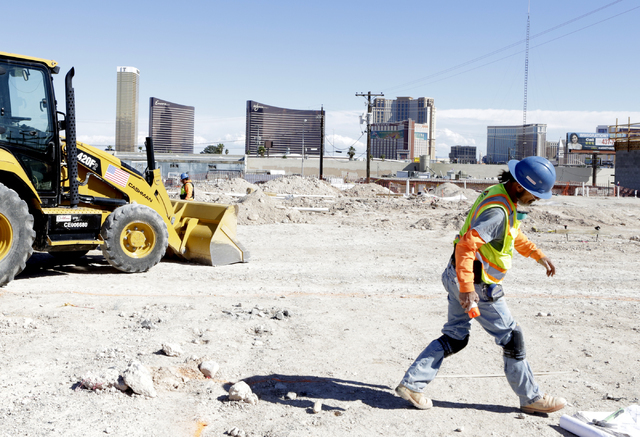 Rental projects are being built or planned near the Strip and downtown. Developer Jonathan Fore is building a 295-unit complex in the Chinatown area; Zappos CEO Tony Hsieh’s Downtown Project has teamed with The Wolff Co. to develop a 231-unit complex downtown next to Atomic Liquors; and The Calida Group, one of the valley’s biggest apartment developers, is planning a project next to the Palms and another in The Hughes Center office park a mile east of the resort corridor. More could be on the way, although the project tally so far is a fraction of that in the suburbs. Still, the spread of multifamily housing in Las Vegas’ core appears to be the first since the market crashed last decade and comes amid rising rents that make these costlier projects feasible for investors. Such projects, being close to restaurants, bars and the region’s main employment base, the Strip, would almost surely draw younger, single adults who want a short commute and nightlife options nearby, and will pay above-average rents. Luring families seems a tougher sell, since they can rent a bigger home in the suburbs for the same price or less. Either way, apartment construction has soared amid lower homeownership rates. Developers opened roughly 1,700 apartment units in the Las Vegas Valley in 2014, then 3,000 in 2015 and 3,500 in 2016, CBRE Group broker Spencer Ballif said. He expects more than 5,000 to open this year. By his count, none of the projects from the past three years were in urban areas, as landlords couldn’t command high-enough rents to book a profit. Urban-area projects can be more expensive because, among other factors: Landowners typically want higher prices per acre than in the suburbs, and with smaller parcels to develop, builders have to squeeze higher-density projects with parking structures on the sites. All told, it’s a pricier undertaking than the typical suburban complex — a sprawling collection of small buildings with surface lots. Fore, managing partner of Fore Property Co., said construction costs for his project at Spring Mountain Road and Valley View Boulevard, a mile west of the Strip, are about 25 percent higher than they’d be in the suburbs. He also said he paid about $1.1 million per acre for the site, whereas land in the valley’s outer edges might cost $400,000 to $500,000 per acre. Rental options at his property, called Lotus, would range from 667-square-foot studios at $1,000 per month to three-bedroom, 1,400-square-foot units at around $2,500 per month. Overall, the average rental rate in Southern Nevada as of the third quarter was $948, up 8 percent from late 2014, according to brokerage Colliers International. More than a few industry pros have questioned whether apartment developers are overbuilding in the suburbs, especially in areas like the southwest valley. Fore also has built in the suburbs, though a lack of competition in the core was one reason he went there. He expects to open the project in March 2018. “I was looking to be in an area where people weren’t,” he said. Calida, which has been building suburban rental projects from Summerlin to Henderson, is buying 4 acres just east of the Palms, with plans for a 287-unit complex wrapped around a six-story parking garage. It’s also buying 6.5 acres at The Hughes Center for a roughly 375-unit project, also wrapped around a six-story garage, Calida co-founder Eric Cohen said. The land sales haven’t closed yet. Cohen declined to say how much his group is paying but said it’s above $1 million per acre. More projects might get underway. Fore said he is looking for development sites near the Strip, and Centura Development Co. founder Rodman Jordan said his group wants to build urban-area apartments as well. Jordan filed plans with Clark County last year for a 471-unit project on Spring Mountain Road, right near Fore’s. The owner of Jordan’s proposed site eventually sold it to another group, but Jordan said he’s not giving up on building an urban project, even if that one fell through. “I wish we had it, and I wish I had something urban I could talk to you about,” he said. High-density housing isn’t new to Las Vegas’ core. During the bubble years last decade, investors built condo towers on and near the Strip as well as downtown and in the suburbs, part of the high-rise craze known as the “Manhattanization” of Las Vegas. Most proposed towers from that era never left the drawing board, including one that was pitched for Calida’s site next to the Palms. Florida developer Christopher DelGuidice bought 8.6 acres at Flamingo Road and Valley View for $50 million in 2004 and laid out plans for Vegas 888, a 50-story luxury condo tower with private butlers, poolside villas and a nightclub called The Whale Club. DelGuidice lost the site to foreclosure in 2007. Las Vegas investor Christopher Beavor bought the vacant lot last year for $13.5 million and is selling part of it to Calida.